Or 6 payments of $233.17 What's this? 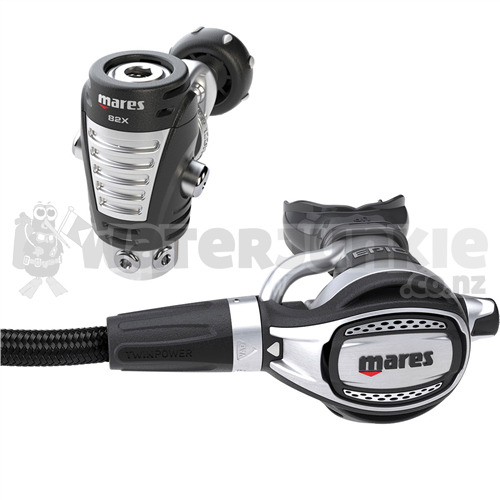 The Mares Epic 82x Regulator combines all of the technology and advancements from its predecessors to make one of the best performing regulators they've made. The 82x 1st stage has a unique swivel turret helping hose routing and an AST dry valve to help keep water out of the first stage. Epic 2nd StageThe Epic second stage has Mares' bypass tube that controls the airflow into the 2nd stage, warming it and preventing fluttering. You have two adjustments on the Epic for airflow the first being the Twin Power System where you can adjust the amount of gas that get it with a normal and supercharged + setting. The 2nd adjustment is for breathing resistance and how hard or easy it is to open the valve when you breath in. The purge button on the front is both wide and hinged so it is easy to use and control. The hinged mechanism allows you to control exactly how much gas will purge and how strong so if you just need a little fresh air you can push it a smidge or if you want to clear the 2nd stage push it all the way to open the valve. 82x 1st StageThe 82x is Mares' first swivel turret 1st stage with 5 low pressure ports, 4 of which can rotate so you can better control the angle of your hoses even in the water. To keep your 1st stage safe from water ingress when unpressurised the 82x has Auto Sealing Technology, AST, that is a spring loaded plug to seal the inlet to better keep water and dust out of the 1st stage during storage and cleaning.